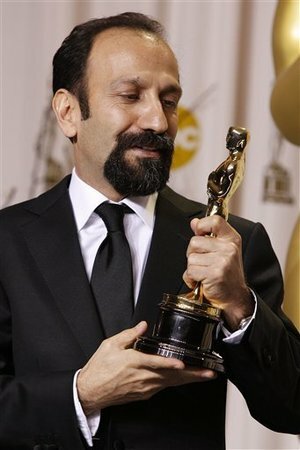 Last night, the brilliant Iranian film A Separation took the Best Foreign Film Oscar. This AP article, picked up by the Washington Post, about Israeli reactions to the film reveals the sheer amount of propaganda Israelis must be subject to regarding their perception of Iran. It's clear they are ignorant of what Iran is actually like...those interviewed are all shocked that the country is full of cars, home appliances, and real live human beings! Yair Raveh, film critic for Israel's leading entertainment magazine, Pnai Plus, said, "Ultimately you don’t think about nuclear bombs or dictators threatening world peace. You see them driving cars and going to movies and they look exactly like us." Rina Brick, 70, said, "Our image of how Iran works is less democratic than we see here. The judge, the police, everyone behaves as if they are in a Western country." Rivka Cohen, 78, who left Iran at age 15, was "surprised by the way people lived in their houses...Everyone had a fridge and a washing machine." Meanwhile, some movie-goers weren't even as enlightened as those above. Moshe Amirav, a political science professor at Hebrew University in Jerusalem, said he "didn’t stop thinking about the bomb the whole time" he was watching A Separation. "I said, what a contrast that we see this Iranian film with such admiration, and then when we leave we think about how they want to kill us," Amirav said. And that guy is a professor. Of political science. At a real university. Here in the U.S., a new Zogby poll reveals that "78% [of Americans] believe Iran is actively pursuing nuclear weapons production" and that "68% say it is likely Iran would attack another nation if it produces nuclear weapons and has the ability to deliver them." Zogby also reports, "When asked what the US should do if it believes Iran has nuclear weapons, 37% support aerial attacks and another 7% would prefer both an invasion of Iran and aerial attacks. Increased economic and political sanctions are backed by 33%, while 10% would want no changes in current US policy toward Iran," while "79% are concerned that attacks on Iran could lead to higher fuel prices." "At this time, many Iranians all over the world are watching us and I imagine them to be very happy. They are happy not just because of an important award or a film or filmmaker, but because at the time when talk of war, intimidation and aggression is exchanged between politicians, the name of their country - Iran - is spoken here through her glorious culture. A rich and ancient culture that has been hidden under the heavy dust of politics. I proudly offer this award to the people of my country. A people who respect all cultures and civilizations and despise hostility and resentment. Thank you very much." Why this puerile one-upmanship. Iranians make good films. Israelis also make good films. Do you what the reactions of Iranians living in the IRI have been when Israeli movies have been shown in Iran? I'm assuming that the IRI permits Israeli movies (both Hebrew and Arabic ones) to be shown in Iran. Looking forward to your response. There is hardly any market for Arabic and Israeli films in Iran. I assume however, in special artistic enviroments such films are reviewed but hardly discussed so as not to give the impression of cultural legitimization to specially Israeli films. Mind you, the same could be said about Burmese films or etc. where there is no market then there is no established interest. I hope you get my message. I'm glad this film won the award. We sorely need some counter to the prevailing propaganda against Iran.